Good & Green will be taking a break from trading this summer – I will be based in the co-op garden in Scariff and simply won’t have time to grow enough produce to sell. Thanks a million to all of our customers who have eaten from our garden over the past 6 years. We have been grateful for your commitment to buying local food and for all the appreciation of the quality of our produce. Our last day for drop in customers will be Wednesday May 27th 2015. For special orders or enquiries please give me a ring on 087 6187908 – if I am available to make up an order I am happy to supply. As I will be in the Co-op Community garden in Scarriff this season it means that we won’t be able to continue with running Good & Green to supply Supervalu or our veg box scheme. We will still be growing a full range of crops for our own use, and there is always more than we need (particularly after becoming used to growing to supply many families). We will open the cabin for drop-in every Wednesday to share in the week’s harvest. If you would like to call in the cabin will be open from 1-5pm. We will operate a certain amount of pick your own this year, so if you would like to get into our garden to choose your food this is your chance! From Wednesday March 25th we will harvest on Wednesdays and set up the cabin for drop-in, 1-5pm. Please see the list under ‘this week’s produce’ for details of the current harvest. Myself and my hoe are on the move… I have just accepted a part time post in the Community Garden in Scarriff. The East Clare Co-op has a multi-level productive market garden, with two polytunnels, raised beds, fruit trees, currant bushes, medicinal and culinary herbs and permaculture garden. Not to mention the gorgeous mosaics throughout the garden and the outdoor pizza oven under construction at the moment. I will be working with the co-op team to develop the crops produced over the coming months. This will supply their vegetarian café which fronts the garden and makes delicious soups, salads and tasty treats. The garden is a valuable resource in the middle of the town, just off mainstreet which offers a restful and beautiful space for rest, relaxation or to learn a little of home food production. That’s where I’ll be this growing season and I am looking forward to supporting their work. However, it does mean that I won’t be in the garden at Good & Green as much, although we will still grow a smaller volume of our full range of crops. We will open for drop-in on Wednesday afternoons, 1pm – 5pm, from Wednesday March 25th. Our Taste of Lough Derg event is coming up this weekend, on Friday evening 15th August, 5pm. We are looking forward to welcoming our customers and visitors to see where and how we grow, the range of food that can be produced in an Irish garden and to remind everyone of just how good freshly grown produce tastes and why you should either grow it yourself or ask for it in shops and restaurants. 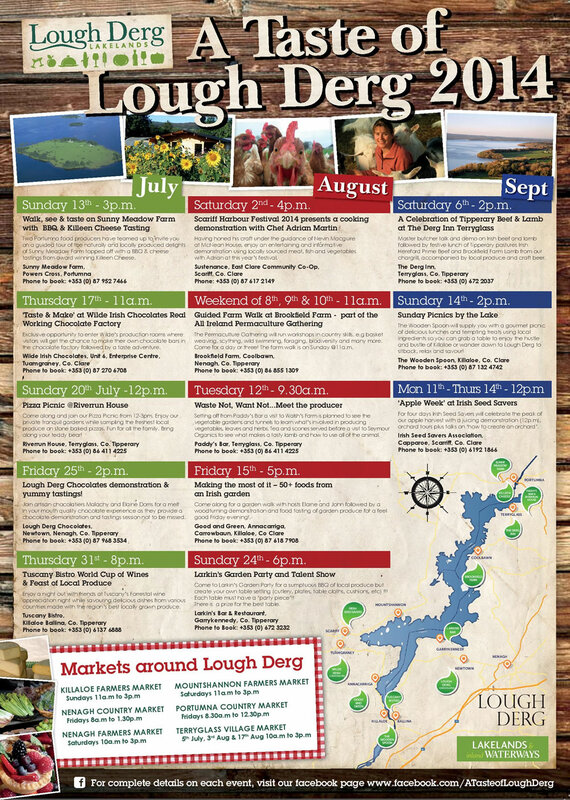 A Taste of Lough Derg is an exciting new food trail launched this summer and continuing for July, August and September. There are a series of food events offered by artisan food producers in the area, offering food tasting, insights into local food products and inspiring summer experiences in food producing gardens. As part of the series we will be hosting a garden walk highlighting the range (50+) of foods that can be produced in a fairly typical Irish garden, a wood turning demonstration using wood gathered in our garden and food tasting of dishes prepared from our produce. Under the title ‘Making the most of it’ we would like to show some of the ways that anyone can produce some of their own food, on any scale. From mixed leaf salads to ‘ring of fire’ chillis an Irish garden is the source of many a family feast. My year spent studying for an MSc in Organic Horticulture is now almost complete, with the graduation ceremony on next week in UCC. It was a fantastic year, and a real luxury (in a hard work sort of way!) to have time to sit and think and talk and study about why it is that we grow the way we do, why it’s important to work with the natural resources and biodiversity around us and to minimise the impact that we have on our soils and our environment where we can. Our type of small scale horticultural enterprise is a model for how to use the land to produce the maximum variety and quality of food without destroying wildlife or the soil on which it all depends. From a small field we are able to produce over 50 different food crops, from salads and herbs to cucumbers and chillis, aswell as a variety of soft and top fruits and nuts. We have our own eggs, meat and preserves from various fruits. All in all we produce alot of the food for our family and supply produce to many families in our area. We use as much natural fertility from compost, manures and green manures (eg. clover, ryegrass) as possible to make the most of on-site resources. We plant flower strips, have beetle banks and nettle strips and encourage as many beneficial insects as we can, to help us manage levels of pests around our crops and provide habitats for bees. We were doing all of this before the MSc, but now it’s nice to be able to pinpoint exactly why all of this is important and helps our small piece of the planet to stay healthy and keep us healthy too! I am very aware that we are extremely lucky to have the space in our garden to make this happen, and have also been lucky to have had fantastic teachers over the years, both in UCC (thanks Peter, Eoin and Klaus),and from the start from Jim Cronin in Bridgetown. My overall impression on reflection is that everyone should and can have a little piece of the planet producing at least some of their food for them. It doesn’t have to be a full scale farm, it doesn’t even need to be a field. If you have a corner of your garden that can be used to grow you will be amazed that in no time you can be eating several meals a week with food that has every vitamin intact, no chemical residue and has travelled a total of zero food miles. Window boxes, patio containers and even compost bags can be used to supply regular salads, herbs or a crop of potatoes if no garden space is possible. Growing can be on any scale and the food you grow yourself is the best tasting food you will ever eat. The more people who grow the more we realise how precious food is and how important it is to protect the resources that we have to make this magic happen. With all of this in mind I am keen to share whatever I know about growing food and self-sufficiency with anyone who has an interest and would like to produce some of their own. Our Good & Green training group is starting this March for homegrowers who would like to learn or improve their growing skills to get reliable results for their efforts. We will run a weekly low cost training session and support group with specific topics and advice on all of the main crops in our garden. The debate about how we can feed the world starts in all of our own homes. We can all grow the best food for ourselves – but be warned… it’s addictive! See the training group post for details. to produce some or most of your family’s food. or 15% disc. for prepaid 12 week term. 11am-3pm at Munster Music Academy Premises. breads & organic superfood salads crafted with love and passion by Tara-Lee.